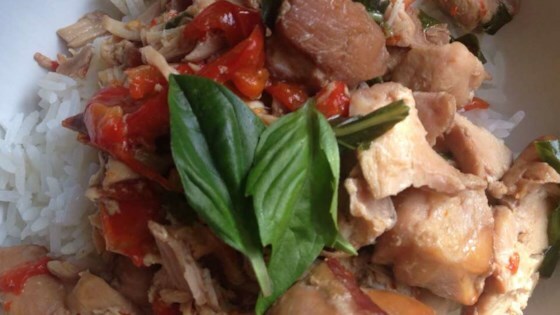 "The secret ingredient for this recipe is Thai basil which has a unique taste. Most Asian markets have it and well stocked supermarkets as well. You can substitute with regular basil, but it won't have the typical Thai flavor." Combine chicken, bell pepper, soy sauce, fish sauce, Thai chile, lime juice, rice vinegar, and ginger in a slow cooker. Cook on Low until chicken is tender, about 5 1/2 hours. Add basil and cook until wilted into the sauce, about 30 minutes more. Season with salt and pepper.